Few developments of recent years are more pregnant with potential for the future than the rise of regionalism in Central Asia. In March 2019, Central Asian leaders will meet for their second yearly summit. With most outstanding issues between regional states resolved, they are now looking to strengthen regional cooperation. This ISDP forum marks the launch of a new Silk Road Paper on the matter, which analyzes the past experience of cooperative initiatives, studies regional groupings worldwide and provides concrete suggestions for possible structures for Central Asia. 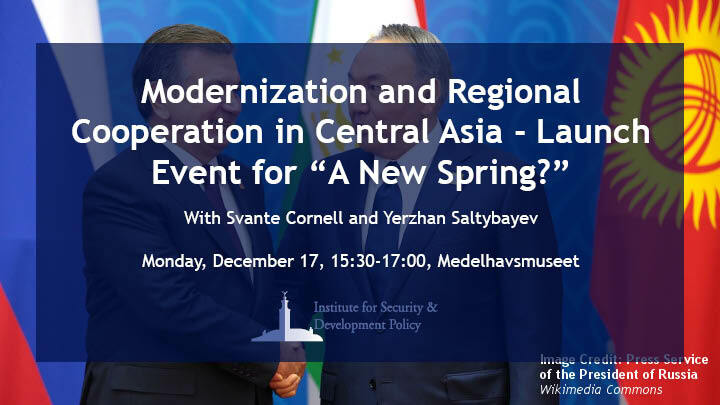 The forum will feature two presentations by Svante E. Cornell, Director of ISDP and Yerzhan Saltybayev, Director of the Institute of World Economics and Politics under the Foundation of the First President of the Republic of Kazakhstan. After the forum there will be a reception with Swedish Christmas delights.